Juan Archuleta returns to preview his showdown against Jeremy Spoon at Bellator 210 in Thackersville, Oklahoma this Friday. Still undefeated since joining the promotion, “The Spaniard” looks to put on another great performance and show the world why he is more than ready to prove himself against the elite in the division. With big plans ahead for 2019 and beyond, we’ll discuss Archuleta’s continued campaign for titles in multiple weight classes, and who he plans to face after dispatching Spoon on Friday. We’ll also get Juan’s take on upcoming matchups featuring his teammates at the Treigning Lab, and much more. Ray Cooper III joins us with little over a month to go before the fight of his career as he looks to capture the inaugural PFL welterweight championship and walk away with a million dollar cash prize. We’ll discuss the matchup against Magomed Magomedkerimov and why “Bradda Boy” believes the Russian doesn’t stand a chance. We’ll also hear Ray’s plans for the cash prize should he be victorious and what this entire experience has been like for him thus far. 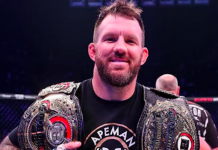 Does Ray move up in weight for next years PFL season after becoming the first welterweight kingpin? Listen in to find out! Jimmy Crute closes out this episode just days prior to his UFC debut in Adelaide, Australia. We’ll get the Aussie prospects thoughts on his opponent Paul Craig, and hear how “The Brute” is feeling ahead of this pivotal career moment. Oozing with confidence, Crute is not only ready to make a big statement in the UFC’s light-heavyweight division, but with head coach and combat sports veteran Sam Greco at his side, he’s ready to take on the biggest names at 205 pounds. From his background as a martial artist, to his performance on DWTNCS, and his aspirations to become a champion, we’ll cover the gambit with Jimmy. Stay tuned every week for more of what you crave!